If you have spent any time on this website, you know that our homepage has a picture of the grave marker for Rene Cossitt and his wife Ruth Elizabeth Porter Cossitt. Since Rene and Ruth lived their adult lives in Granby, Hartford County, Connecticut it is appropriate that they are buried in a cemetery in Granby. Cossitt tradition informs us that they are buried in what is now called the Baptist Cemetery. Owing to the advanced state of the effects of weather, at this point in time it is impossible to find an original marker with either name on it. The marker that we find today was installed by Cousin Tom Cossitt as part of the 1977 Cossitt Family Reunion. On one side of the marker is the name of Rene and on the other side is the name of Ruth. How do you find the graves of the descendants of Ruth and Rene? Several years ago, a website was created that allowed family, friends, and others with good intentions to create an online memorial for a deceased person. 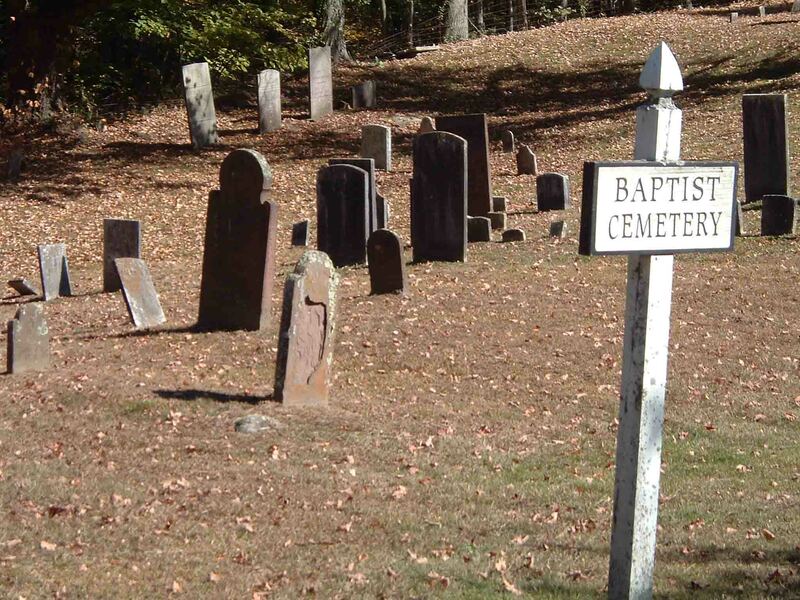 This website is called findagrave.com and can be accessed at www.findagrave.com The website is free unless you desire to sponsor a memorial at the nominal fee of $5.00. Anyone can access findagrave.com but if you desire to create memorials or suggest changes to a memorial, you must first join. Joining is also free. Each memorial is assigned a number by findagrave.com. Depending upon how much is known about the deceased, the amount of information available may be extensive or limited. Ideally a memorial should provide a link to the deceased parents, spouse, and children. Many of the memorials also include photos of the deceased, pictures of the grave marker and copies of the obituary. In the case of Rene Cossitt, his findagrave.com memorial is numbered 35775285. To check it out go to www.findagrave.com and click on Search 132 million grave records" In the box next to Memorial #. insert 35775285 and then click on "Search". If you are looking for any other person, put in the name and some dates where asked. Like all websites, the more that you use it, the better you will understand it and enjoy it. Click on the links to Ruth as well as all of their children and so forth. 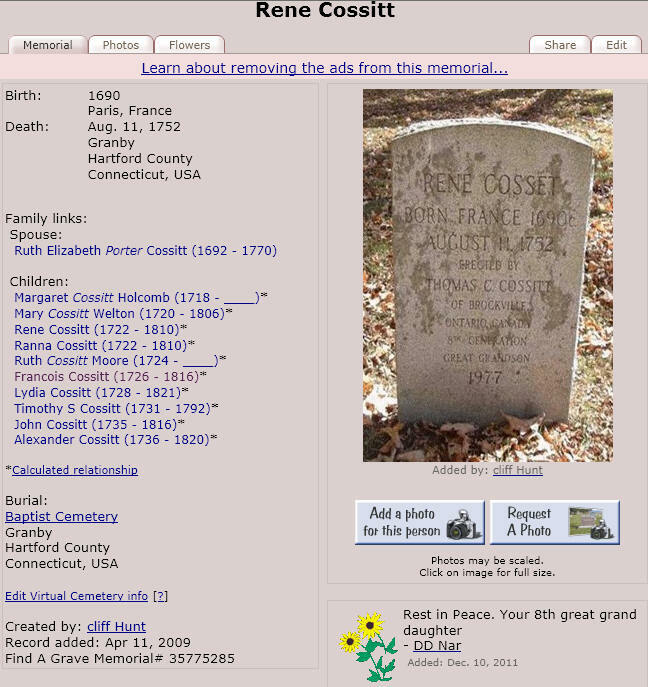 I must note that findagrave.com does not verify any of the information. If you find a mistake, join the website and then send a message to the person who is managing the specific memorial. Have fun searching for your close relatives. If you do not find a memorial for them, you should create one for them. Keep going and you will be amazed at what is out there. Copyright © 2015 Cossitt Family Association Inc. All Rights Reserved. First published August 29, 2015, updated on August 31, 2015.